There is some debate amongst film fans as to which of the first two Alien films are the best – let’s ignore what happened after Aliens, as it all goes somewhat downhill from there. Alien is a true horror film set in space. OK, the premise wasn’t original then, and has been much copied since, but it’s an absolute classic and is (arguably) one of Ridley Scott’s best films. Aliens is a very different beast (pun intended), taking the premise of the first film and tuning it into probably the best sci-fi war film ever made. I am convinced that part of the genius of Games Workshop producing Space Hulk when they did was its tie in with the Aliens movie. OK, there is a change in location and story, but the basic format of Space Marines moving through darkened corridors and being ripped limb-from-limb by super-fast-super-strong aliens (or Genestealers in this case). Space Hulk was ‘Aliens: the board game’ long before AVP: The Hunt Begins came along. Whilst combat has been a staple of miniatures games for some time, until recently the horror genre has been pretty much reserved for Role-Playing Games or Video Games. However, there have started to be a number of horror/survival games appearing on the market in recent years – games such as Dead of Winter, Betrayal at House on the Hill, Mansions of Madness and Deep Madness to name a few. I’m not a big fan of Zombies, and whilst I do love H.P. Lovecraft, it would be nice to have a decent horror game that didn’t come back to that theme (even Deep Madness, which I backed on Kickstarter last year, have a Lovecraft/sci-fi theme going on). Fighting through dizziness, you open your eyes, the lights of other hibernation chambers blinding you momentarily. Broken glass. Wet floor. A stasis pod burst open like a ripe watermelon, dripping with red. The thing inside was once your friend. Now it barely resembles a human, ripped open from the inside – damage too severe for a simple stasis pod failure. You raise up and check if your other mates are all right. The good news is: they are. You all gather in the middle of the room, shivering, half-naked. The bad news is… plentiful. Ship stuck in the middle of nowhere. Many systems damaged. Bulkheads breached. Unknown contaminants in the air. You also hear noises in the hollow halls of the ship. You’re not alone! Awaken Realms have run several Kickstarters before, including The Edge: Dawnfall and Lords of Hellas, so I’m hoping that they know what they are doing with this sort of project. 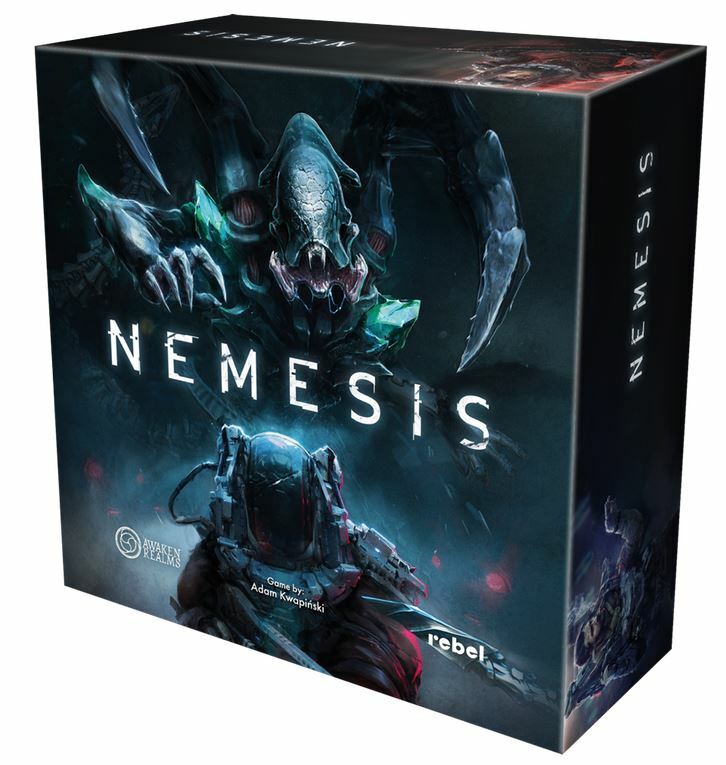 The kickstarter project for Nemesis was launched at 16:00 on 17th January, and reached its £50,000 funding target in 3 minutes. In the first hour it raised over £300,000, so it’s fair to say that the project has caught a lot of people’s imagination. Check out the Kickstarter page – it has lots more details on the game, the miniatures, plus several play through videos and reviews. The project is running until the 7th February, and is due for delivery in September 2018 (core box) and April 2019 (stretch goals). Hi, thanks for the article. I wonder if this game has a “campaign mode”, such as Space Crusade or any other dungeon crawler, where characters increase their skills as consequitive story-line connected rounds are played?